You’re playing a sit n’ go tournament in the late stages. Blinds are 2,000/4,000 and there’s 3 people remaining in the tournament. 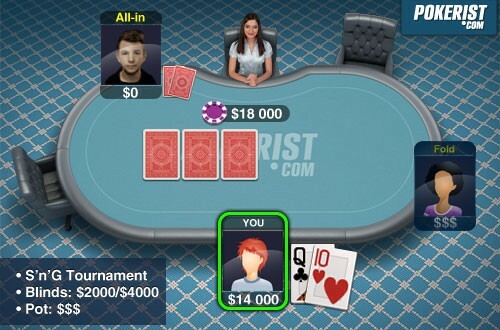 You’re in the big blind with 14,000 chips holding Q♣10♥ and the button who has 18,000 chips goes all-in for the 3rd time in a row from the button. Small blind folds and its up to you whether you call or fold.